After Edgar Wright departed the project, it was uncertain who would step in to direct Marvel’s Ant-Man. Eventually the job went to Peyton Reed who turned in a fun romp of a superhero film, but what if it had gone to another filmmaker? A filmmaker obsessed with the brutal world of nature and its unrelenting grim indifference to the orders of man? 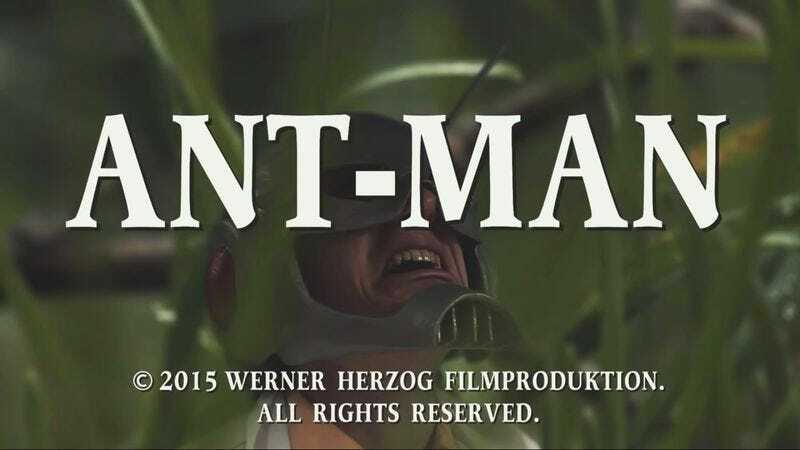 What if Werner Herzog had directed Ant-Man? That’s the crux of the fake trailer made by Patrick Willems, which finds a perturbed and shrunken Scott Lang trying to navigate the stark landscape of the world of ants. With spot-on Herzogian narration by Scott Thomas, the trailer chronicles Lang’s attempts to live in a world where brutality is the order of the day and disgusting creatures roam freely. It’s a great reimagining that properly instills the dread and contempt that Herzog feels towards nature, and finds a way to incorporate his greatest nemesis, the chicken, into the proceedings.